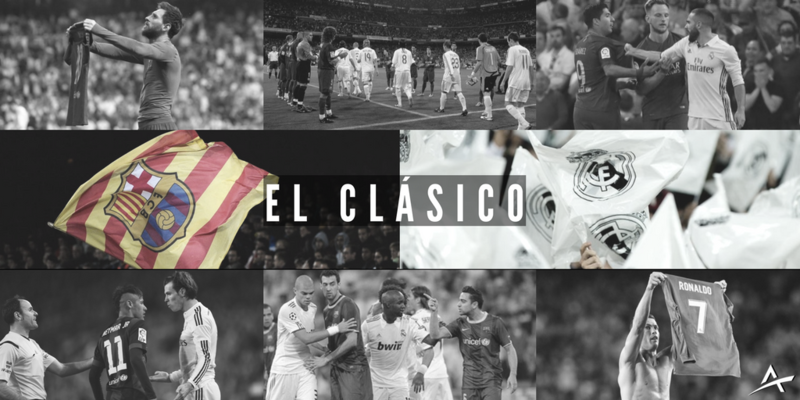 “El Clásico” is the most anticipated match during the year and refers to any game played between Barcelona and Real Madrid. This matchup is usually one of the most-viewed sporting events around the world and on Saturday at 7 am ET the two Spanish giants will meet at Santiago Bernabéu Stadium in Madrid in a game that already has pretty important title implications. Barcelona lead La Liga with an undefeated 13-3-0 mark (42 points) while Real Madrid sit in 4th place at 9-4-2 (31 points). Real Madrid are nearly four full wins behind Barcelona but do have a game in hand, and it would be big for them to get all three points in this one to stay in the title race. Not to mention, there are two other clubs standing between Barcelona and Real Madrid: Atlético Madrid (36 pts) and Valencia (34 pts). Real Madrid opened as the +117 favorites at Pinnacle and +112 at Bookmaker, right around a 45% chance to win. Barcelona opened +217 at Pinnacle and +206 at Bookmaker, which gives them about a 32% win probability. The draw opened with the longest listed odds of +294 at Pinnacle and +289 at Bookmaker (25% chance). The line movement hasn’t been too drastic yet, and public betting has gone as expected. Just about 50% of tickets around the market have taken Real Madrid with the other 40% on Barcelona and 10% on the draw. This match will take considerable action around the world and lines can vary based on the sportsbook due to different liabilities. It’s the type of match where allegiances will lead to very biased bets (i.e. Barcelona fans betting on Barcelona to win, Real Madrid fans betting on Real Madrid) and oftentimes the draw is overlooked. However, that has been a good thing in this matchup as they’ve only drawn three times in their last 20 La Liga meetings. A draw would actually be a great result on the road for Barcelona to keep their distance at the top of the league and I’d lean that way at the moment (shocker, right?). I’d expect a steady flow of bets to keep coming in on Real Madrid as fans know they need to win this game, while Barcelona will garner a lot of attention because of the great price you can get them at (+219). One thing to keep in mind is the high total of 3.5 goals. I can’t see either of these teams pitching a shutout and oddsmakers don’t either– both have a listed team total of 1.5 goals with heavy juice on the Real Madrid over. Live, in-game betting is a great option for a match like this once one team scores since more goals are likely coming. Bettors will have the option to take the draw once a team goes up 1-0 and should be able to get a pretty good price. Barcelona are currently -500 favorites to win La Liga with Real Madrid at +450. Barcelona is 11 points ahead of Real Madrid, but they’ve played one more game. There’s also Atlético Madrid (+1600) and Valencia (+8000) lurking in the mix should Barcelona slip up. The most recent matchup exactly eight months ago was a memorable one with Messi winning it for Barcelona in stoppage time, 3-2, for his 500th career goal for the club. Late goals tend to happen often when these teams collide. Real Madrid scored in the 90th minute to grab a point in their first meeting last season, and scored an 85th-minute winner in the previous match two seasons ago. Real Madrid lead the head-to-head results in competitive matches with 95 wins to Barcelona’s 91, while Barcelona lead in total matches with 111 wins to Real Madrid’s 99. I guess Barcelona likes to rake up those wins in friendlies for the casual fans. Along with Athletic Bilbao, Barcelona and Real Madrid are the only clubs in La Liga to have never been relegated. It doesn’t look like either will be in danger for a long, long time. No player has ever scored more times in El Clásico than Leo Messi with 24 goals. After hitting the post three times in his last match, I’d feel pretty good about him adding to his record total on Saturday. Had a feeling I would be seeing a draw mentioned in this write-up. Excited to read your breakdown of the Arsenal/Liverpool matchup tomorrow. As a Liverpool fan I have no idea what to expect going in. If you have a play for the match then of course I will be on it. I may also put a half unit on the Under. Seems like everyone thinks it will be high scoring affair. It makes me think it could be a good contrarian spot if the public pushes it to 3.5. Thanks as always for the soccer blog. I like your thinking on Arsenal-Liverpool and was contemplating about the contrarian under there as well. It’s a big 3 points for both teams and they may be tight.